Jean Houston is inviting people to Ashland, OR to become social activists. I spent a week in one of Jean's workshops once and it was an amazing experience. I can't attend this adventure but I thought I'd pass along her nine steps to engage the "alchemical path." I'm going to devote Thursdays for the next nine weeks to delving deeper into these steps ... and invite you to join me either through comments on this blog or by posts on your own blog. If you do blog, please leave a comment with a link to your post. One:Wake Up. Become aware of what works, and what doesn't, in your life, and in your world. Three: Get Clear. Discover and practice your essential gifts. What gives you meaning and purpose? Four:Take a Stand. Make boldness a habit. Be willing to stand for your life and the earth. Five:Explore Resources. Tap into the riches of your inner treasure house and learn to find their appropriate associations in the outer world. Six: Create a New Story. One that heals, sustains and enlivens your presence in the world. Seven:Take Your Show on the Road. Join with allies, make plans, set projects in motion. Eight: Burn Through, Not Out. Learn and practice techniques, skills and processes to help you keep on keeping on with a high heart. Nine: Begin Again. Learn the joy of always being ready to spiral up to the next level. About the Image: I didn't move to California to spend my life unpacking boxes so today I headed up to Mammoth Pools where the water was clean and clear and I found this dragonfly playing around in one of the streams. By the way, the color is not altered ... that stream is filled with iron ore and I found the most incredible colors. Since he showed up and held still long enough to get this photo, I looked up dragonfly medicine and found the following ... I think he wants to share his medicine with all of us! Dragonfly embodies a stripping away of all the beliefs that say we cannot do this or that, achieve a dream or goal, it is to remind us that anything is possible when we really get the understanding that we are part of Spirit and as such we have the power to manifest anything that we desire. 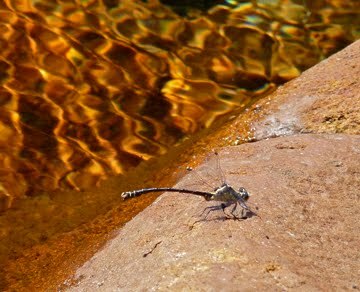 Dragonfly is the keeper of dreams, the knower within that sees all of our true potential and ability. Dragonfly strips away the illusions that say to us we cannot achieve our dreams and goals, that we are not worthy or capable when in fact it is our birthright and our true power to create anything we choose! My daughter collects dragon flies -- now I know why! Louise ... there is nothing you can't keep up with ... but I love the note anyway! Great invitation to do and most of all be. I'll look forward to reading your posts on each of the steps.